Bosphorus - The General Screw Steam Shipping Co. Ltd.
Machinery: 80h.p. by Maudslay, Sons, & Field. 8 knots. Twin cyn. Diag. Dia of cyl 36 inches; stroke, 24 inches. Dia. of Screw 10' 6"; pitch, 18 feet 6 inches; revs, 62.2. Length of engine-room, 30 feet; capacity, 20 feet wide by 8 feet fore and aft; 6 feet high. Coals, 150 tons. 300 ihp. Decks: One deck and raised poop. Three masts. Certificate granted 10th July 1848..
Other info: Launched by Miss S. Zohrab. A man's bust figure head. Intended to run between Liverpool, Malta, and Constantinople. History: 13th August 1849. Went on her first sea trials down the Thames. 29th August 1849. Went on her second sea trials down the Thames. Draft forward 6 feet 8 inches; aft 9 feet 6 inches. The screw 14 inches out of the water. 3rd September 1849. Sailed from the East India Docks for Liverpool, Captain J. V. Hall, for passengers, with a full cargo for Malta etc. 16th September 1849. Due to sail from Liverpool for Malta and Constantinople. 11th October 1849. Sailed from Constantinople in the evening for Smyrna. 13th October 1849. Sailed from Smyrna for Malta. 17th October 1849. Sailed from Malta for Gibraltar. 23rd October 1849. Sailed from Gibraltar for Liverpool, England. 30th October 1849. Arrived in England with a cargo of goat’s wool, figs, leeches, etc. 21st April 1850. Sailed from Liverpool for Constantinople. April/May 1850. Arrived at Gibraltar from Liverpool. 21st May 1850. Sailed from Constantinople. 28th May 1850. Arrived at Malta from Constantinople. 5th June 1850. Arrived at Gibraltar. 2nd June 1850. Arrived at Gravesend from Constantinople. 4th August 1850. Sailed from Gibraltar for England at 6 p.m.
15th December 1850. Due to sail to the Cape of Good Hope but delayed due to violent gales. 18th December 1850. Sailed from Plymouth, Captain J. V. Hall, touching at Madeira, for the Cape of Good Hope, with 16 passengers and a light cargo. Fitted with a new type of propeller, being the first ever tried. The two blades, fixed on their axis, and thus, though revolving, opposing considerable resistance when sailing, are in this screw made, by a very simple mechanism, to turn in the direction of the keel, so that nearly all obstruction is removed when sailing. Being the first mails for the Cape of Good Hope, Sierra Leone, and Cape de Verd dispatched from Plymouth the occasion was marked by a grand demonstration; the mails being conveyed from the Post Office in a carriage and four greys, followed by a procession, including three military bands, the mayors of Plymouth and Devonport, and the magistrates, the police, and a large number of persons interested in the property and trade of the town. 24th December 1850. Arrived at Madeira. 4th January 1851. Sailed from Sierra Leone. 27th January 1851. Arrived at the Cape of Good Hope. 2nd February 1851. Sailed from Cape of Good Hope at 11a.m. Her mail contained 2,181 letters and packets, and 1,623 newspapers. A full cargo, but only one passenger. 18th February 1851. Arrived at Sierra Leone. Had difficulty in coaling. Delayed for one and a half days. 22nd February 1851. Sailed from Sierra Leone. 28th February 1851. Anchored at St. Vincent. Sailed same day. 12th March 1851. Arrived at Plymouth. 15th April 1851. Sailed from Plymouth for Cape Town. Captain J. V. Hall. 28th April 1851. Arrived at St. Vincent’s. 5th May 1851. Arrived at Sierra Leone and delayed nearly four days due to coaling. 25th May 1851. Arrived at Cape Town, with fifteen cabin passengers and five steerage. During her stay she experienced very bad weather. She parted a cable, and was obliged to steam about the bay for a few hours. 31st May 1851. Sailed from the Cape of Good Hope at 2•30 p.m.
8th June 1851. Passed half a mile from St. Helena. 16th June 1851. Arrived at Sierra Leone. 23rd June 1851. Arrived at St. Vincent’s. 24th June 1851. Sailed from St. Vincent’s. 8th July 1851. Arrived at Plymouth at 6 p.m., Captain Hall, from the Cape of Good Hope, four days early. She brings a full cargo of ivory, wool, gold-dust, and hair. The mails were in charge of Commander Woolridge and were landed immediately and forwarded unasserted to London. 15th August 1851. Sailed from Plymouth for Cape Town. Captain J. V. Hall. 26th August 1851. Arrived at St. Vincent’s at 11·30 a.m.
27th August 1851. Sailed from St. Vincent’s at 5 p.m.
1st September 1851. Arrived at Sierra Leone at 8 a.m. and ailed at 8 p.m.
23rd September 1851. Arrived at Cape Town at 6 a.m.
1st October 1851. Sailed from Cape Town. 17th October 1851. Touched at Sierra Leone at 1 a.m.
22nd October 1851. Arrived at St. Vincent at 1·30 a.m.
23rd October 1851. Sailed from St. Vincent. 5th November 1851. Arrived at Plymouth, Captain J.V. Hall, from the Cape of Good Hope at 9 a.m.
5th December 1851. Sailed from Sierra Leone. 16th December 1851. Sailed from Plymouth for Cape Town. Captain J. V. Hall. 30th December 1851. Arrived at St. Vincent. 4th January 1852. Arrived at Sierra Leone. 5th January 1852. Sailed from Sierra Leone. 27th January 1852. Arrived at Cape Town at 11a.m. 3rd February 1852. Sailed from Cape Town at 4 p.m. with a full cargo. 12th March 1852. Arrived at Penzance for a supply of coals, and sailed. 13th March 1852. Arrived at Plymouth at 5 a.m.
15th April 1852. 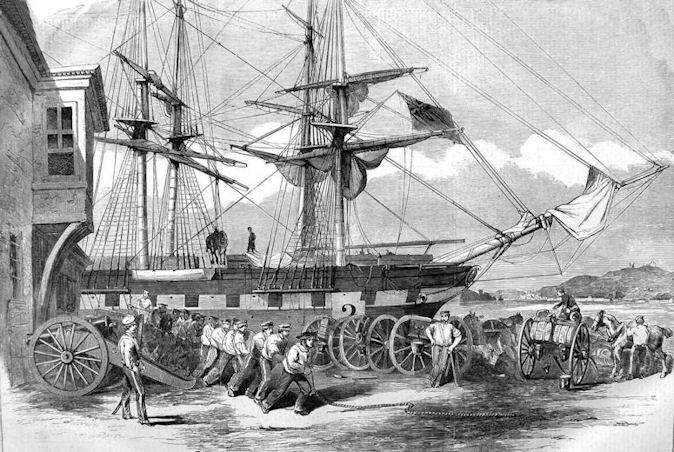 Sailed from Plymouth, at 3·30, for the Cape of Good Hope with a full cargo of British manufactured goods, silks, jewellery, plate, etc. Captain J.V. Hall. Before she sailed the crew were mustered and ship inspected by Commander Rodd. Captain Hall, who has had great experience in the navigation of iron ships, and has paid considerable attention to the variation of the needle, takes with him one of Captain Walker’s patent compasses, in order to observe the working of this ingenious instrument, and to develop its results at the end of the voyage from the Cape. 27th April 1852. Arrived at St.Vincent. 29th April 1852. Sailed from St. Vincent. 4th May 1852. Arrived at Sierra Leone. 24th May 1852. Arrived at Cape of Good Hope at 1p.m. 29th May 1852. Sailed from Cape of Good Hope for Plymouth. 30th May 1852. At 60 miles north of Table Bay passed a bark under American colours, supposed to be the ‘Spring Bok’. 5th June 1852. In lat. 47 • 40 N., long. 9 • 0 W., passed the schooner ‘Kate Robertson’. 13th June 1852. Arrived at Sierra Leone. 14th June 1852. Sailed from Sierra Leone. 19th June 1852. Arrived at St.Vincent. 21st June 1852. Sailed from St.Vincent. 6th July 1852. Arrived at Plymouth, after a tedious passage, Captain J.V. Hall, from the Cape of Good Hope with a cargo consisting of wool, rhinoceros horns, ivory and bees wax. 22nd July 1852. Due to sail from London for Plymouth. Captain John Vine Hall. 25th July 1852. Due to sail from Plymouth for the Cape of Good Hope. 27th July 1852. Sailed from Plymouth for Cape Town with one passenger and a very small mail. Captain H. B. Benson. 7th August 1852. Arrived at St. Vincent. 9th August 1852. Sailed from St. Vincent. 2nd September 1852. Arrived at Cape Town. 6th September 1852. Sailed from Cape Town, calling at St. Helena and St. Vincent. 15th September 1852. Sailed from St. Helena. 19th September 1852. Sailed from Ascension. 28th September 1852. Arrived at St. Vincent. 1st October 1852. Sailed from St. Vincent. 18th October 1852. Arrived at Plymouth. 18th December 1852. Arrived and sailed from Plymouth for Cape Town, Captain H. B. Benson. 30th December 1852. Arrived at St.Vincent. 1st January 1853. Sailed from St.Vincent. 11th January 1853. Arrived at Ascension. 25th January 1853. Arrived at Cape Town. She performed the passage in 37 days entirely by steam. During the night a very heavy squall parted the bridle chain attached to her moorings, and took the sandy beach just opposite to the Fishery, at dead low water; but with the rising tide and judicious use of steam, came off in about an hour. A survey was held on her by the Acting Port Captain Wilson, and Capt. 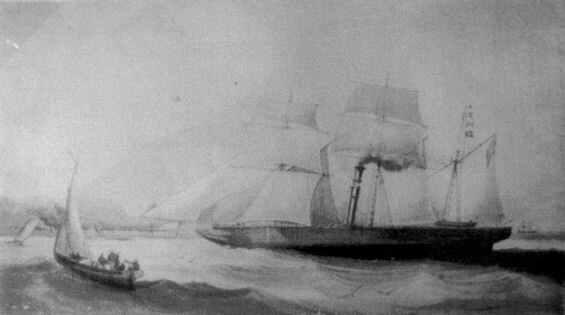 Toby of the ‘Fredrick Huth’, who reported that she was not injured. 30th January 1853. Sailed from Cape Town. 26th February 1853. Arrived at Ceylon. 15th March 1853. Sailed from Calcutta for Plymouth. Captain Henry B. Benson. 20th March 1853. Arrived and sailed from Madras. 23rd March 1853. Arrived at Point de Galle. 24th March 1853. Sailed from Point de Galle. 4th April 1853. Arrived at Mauritius. 6th April 1853. Sailed from Mauritius. 17th April 1853. The 'Indiana' exchanged signals with the American ship 'Siam', under jury foremast, not requiring assistance offered by the 'Bosphorus' lat 34•38S, long 23•47E. 19th April 1853. Arrived at the Cape of Good Hope. 21st April 1853. Sailed from the Cape of Good Hope. 30th April 1853. Arrived and sailed from St.Helena. 3rd May 1853. Arrived and sailed from Ascension. 12th May 1853. Arrived at St. Vincent. 13th May 1853. Sailed from St. Vincent. 22nd May 1853. Only 700 miles from Plymouth, expected at Plymouth 25th but it was blowing a strong gale from N.N.W. to N.N.E. The gale was very heavy, with a tremendous sea, which compelled her to lay to. The only damage done in the gale was loss of head-rails and knees. 27th May 1853. Arrived at Plymouth. 28th May 1853. Arrived at Southampton with a cargo of indigo, silk and specie. 14th July 1853. Sailed from Southampton for the Cape of Good Hope, Mauritius, Ceylon, Madras and Calcutta. Captain Maynard. She had 26 passengers, a full cargo, a specie of £10,000, and a small quantity of quicksilver. 15th July 1853. Arrived and sailed from Plymouth. 27th July 1853. Sailed from St.Vincent. 6th August 1853. Arrived at Ascension. 22nd August 1853. Arrived at Cape Town. 26th August 1853. Sailed from Cape Town. 6th September 1853. Sailed from Ascension for the Cape. 15th October 1853. Sailed from Calcutta for Southampton. Captain Maynard. 20th October 1853. Sailed from Madras. 24th October 1853. Arrived at Point de Galle. 1st November 1853. The crank pin of the main shaft of the engines, which is solid cast iron, about a ton in weight, broke in two pieces. Mr. T. Turner, chief engineer, manufactured a steel plate, and ingeniously forced it, one-half into the crank, and the other half into the crank pin, in a hole one inch and three-quarters in diameter and six inches deep. 6th November 1853. Sailed from Mauritius. A spare steel pin two inches in diameter was obtained. 18th November 1853. Arrived at Cape Town. On arriving the manufactured steel plate was discovered to be broken; it was replaced by the pin obtained at Mauritius. 21st November 1853. Sailed from the Cape of Good Hope. 29th November 1853. Sailed from St. Helena. 3rd December 1853. Sailed from Ascension. 12th December 1853. Arrived and sailed from St. Vincent. 26th December 1853. Put into Corunna due to bad weather. 28th December 1853. Sailed from Corunna. 6th January 1854. Arrived at Plymouth from Calcutta. She arrived under sail. Since the accident to her machinery she has been under sail as her machinery was shut down due to bad weather and heavy seas. 4th February 1854. Sailed from Southampton to Port Phillip and Sydney, Captain B. Douglas, with the intention to offer the ship for sale in Australia. If not disposed of, to employ her in the colonial trade in running to and from Melbourne and Sydney. She is too small for regularly performing voyage’s from England to Australia. 18th February 1854. Arrived at St. Vincent. 26th April 1854. Arrived at Adelaide. 4th May 1854. Arrived at Melbourne. 7th May 1854. Arrived at Sydney with 10 passengers. 9th May 1854. The brig ‘William Woolley’ at Miller’s Wharf, was burned to the water’s edge, Captain Douglas helped in efforts to fight the flames. 15th May 1854. In Darling Bay, Sydney. 2nd June 1854. Left Sydney for Melbourne with 32 passengers, and being used as a branch ship between Melbourne and Adelaide. 25th July 1854. Arrived at Sydney from Melbourne with 17 passengers. 31st July 1854. Sailed from Adelaide at 6 p.m.
3rd August 1854. Sailed from Sydney for Melbourne to met up with ‘Lady Jocelyn’ for the mail. 2nd September 1854. Anchorage inside Port Phillip Heads from Melbourne and Adelaide with 86 passengers. 9th September 1854. Arrived at Sydney with the mail from Adelaide for the ‘Croesus’. 16th November 1854. Sailed from Port Phillips for Adelaide. 18th November 1854. Arrived at Adelaide from Port Phillips. 21st November 1854. Sailed from Adelaide for Melbourne. 11th March 1855. Sailed from Sydney for Adelaide. 14th May 1855. Waiting for the Adelaide mail for Melbourne. 25th May 1855. Arrived at Melbourne from Adelaide. Vessel to be offered for sale. If a satisfactory price is not offered, she will be sent back to England. 19th June 1855. Sailed from Melbourne for Point de Galle. 23rd June 1855. Sailed from Australia. 7th July 1855. The Captain reports, after a good run round from Melbourne, having sent a boat on shore at Cape Northumberland, to visit the wreck of the ‘Young Australian’. Her freight on board is only consists of specie and gold dust having 20,763 sovereigns and 7,795 ozs. 8 dwts. gold dust. She sailed again for Ceylon. 25th August 1855. Sailed from Mauritius. 9th September 1855. Arrived at the Cape of Good Hope. 13th September 1855. Sailed from Cape of Good Hope. 26th October 1855. Arrived at Southampton with 9 passengers, a small cargo, and 2 lions. 1855. Used as a troopship in the Crimean War. 5th January 1856. Sailed from Balaklava. 3rd March 1856. Arrived at Malta from Constantinople. 4th March 1856. Sail from Malta for Liverpool. 2nd April 1856. Sailed from Gravesend for Calcutta. 16th May 1856. On passage to England the 388 men of the Royal Artillery. 9th November 1856. Arrived at Gravesend from Patras. 1858.? Bought by William Inman. 4th January 1858. Sailed from Southampton for the Cape of Good Hope. 13th February 1858. Arrived at Capetown, chartered by the Union Line. 22nd March 1858. Sailed from the Cape of Good Hope. 30th March 1858. Arrived at St. Helena. 3rd April 1858. Arrived at Ascension. 14th April 1858. Arrived at St. Vincent. 29th April 1858. Arrived at Plymouth with £1,200 of Specie, 560 tusks of ivory, 45 packages of wool and general cargo. 3rd May 1858. Passed Deal for London from Callao. 11th May 1858. Arrived at Liverpool from Bombay. 11th March 1859. Arrived at Gravesend from Odessa. 14th May 1859. Sailed from Gravesend for Algoa Bay. 17th May 1859. Off the port of Liverpool, from Calcutta. 1st August 1860. Off the port of Liverpool. 19th March 1861. Troopship. From Hong Kong with the 87th Regiment on board was at anchor in Simons Bay. 6th August 1861. Passed Deal from Cochin. 3rd February 1862. Off Liverpool. 18th September 1863. Off the port of Liverpool. 27th November 1863. The ‘Boshorus’ of Liverpool, arrived at Cardiff, reports having passed large quantities of deals, portions of masts, and three hogsheads with large wooden hoops. 5th April 1864. Sailed from Liverpool for Trinidad. 6th January 1865. On voyage Liverpool for Rangoon, spoken to. 31st January 1866. Sailed from Liverpool for Boston. 18th September 1867. Sailed from Liverpool with stores for the Abyssinian expedition. 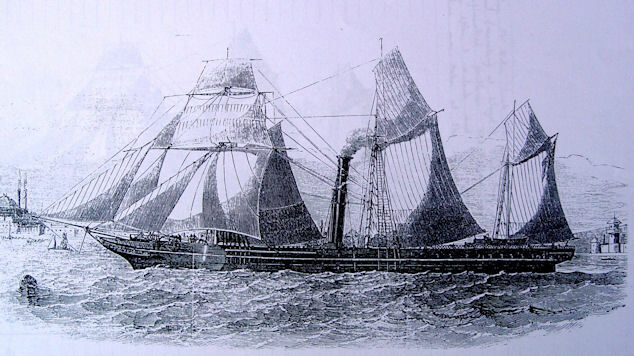 Captain Alexander – owned by Messrs. W. H. Dixon and Co., of Liverpool. 19th October 1867. Sailed from Simon’s Bay in the evening. 21st October 1867. Wrecked on Zitzikamma Point, Cape Colony. (Algoa Bay, Cape of Good Hope) Of a crew of 85, 47 are lost. The survivors all badly bruised, and nearly all naked. She held together for three hours, when she parted lengthwise, and precipitated everyone into the sea – which was breaking over her topmast heads – with the exception of the first officer, who, with the second, had volunteered to get a line ashore with the only remaining boat. She was stove after leaving the vessel, and they struggled ashore anyhow. Survivors left Humansdorp for Port Elizabeth on 23rd October. Lieut. Baker was bruised more than any of the rest. All engineers, firemen, stokers, stewards, and cooks drowned. When she struck she was going at full speed, with sails set.